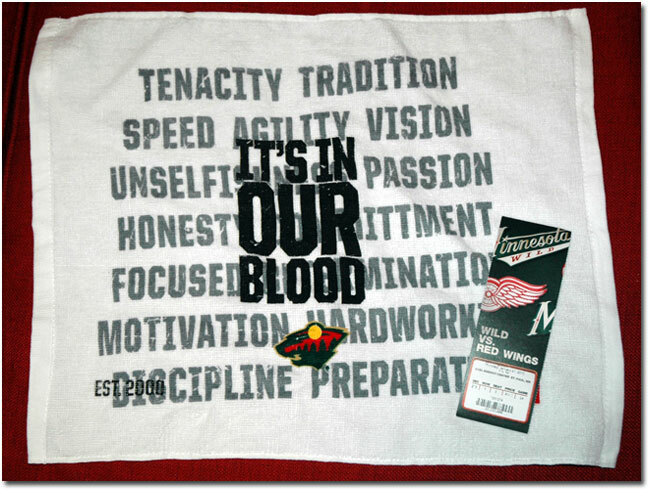 We were one of the first 6,000 at the X who received the towel pictured above. I don’t really remember anyone waving them, but the start of the game was a little hard to watch. Harding was playing really well before he got hurt and it was extra painful to watch Bertuzzi with the breakaway goal. As we’ve learned this year, never leave early. I usually would be happy with the loser point in this situation, but the Wild had so many good chances to win in the OT and shootout, that it really felt like a letdown. Not much else to report – parking was a little harder to find for some reason and the pretzel I ordered was a little stale and way too salty. Oh yeah, I still long for free wi-fi in the building – will that ever happen? My third day of ski-bum week was spent at Wild Mountain outside of Taylor’s Falls. I read on their web site you could get a free pass on your birthday and figured that was too good a deal to pass up. The weather wasn’t the greatest (misty fog that never burned off), but the temps were OK and the snow quality was good. I figured my last visit to Wild was likely 20+ years ago and the ski area is basically the same – four chairlifts and a nice variety of runs, including Ego Alley, North and South Wild, Bear, Competition and the infamous Wall. The inside of the chalet was like a time warp back to high school ski trips, although now I can go in the Eagle’s Nest. They cooked me a mean French Dip sandwich with fries for lunch and had free wi-fi, which was very useful in an area of poor cell coverage. There is now a tubing park just south of the main skiing area and they still have the alpine slide tracks. I think the water slides and small water park near the chalet are new since I was there last. I sort of forgot they are seven miles north of Taylor’s Falls along the river, so it takes about 90 minutes to get there from the south metro. The week of birthday dinners started Sunday night when Colleen surprised me with a 5PM reservation at Bar La Grassa in Minneapolis, the Star Tribune’s 2009 Restaurant of the Year. I had read some of the reviews and was excited to check it out. We found street parking directly across from their building at 800 North Washington Avenue. They also had valet parking available for $3, but with the meters not enforced on a Sunday, we just took an open spot. The restaurant didn’t open until five and a fairly large crowd was waiting outside the locked doors. We were seated almost right away, though, and had a great table near the wine rack. The room has a lot of atmosphere, including a giant picture of Johnny Cash. How can you go wrong with that? Being a picky eater, I wasn’t too sure about the antipasti or the bruschetta, but both were incredible. I’ve never seen apples sliced so thin and I’m a huge fan of prosciutto, so that is a dish I could eat every day. The fettucine was the best I’ve had outside of the original Alfredo’s, which is saying a lot. The Star Tribune story said the desserts were a weakness, but the caramel crespelle was a perfect end to a great meal. The room was packed the entire time we were there, but the noise was never too bad. They do occasionally play music, but it was very much in the background. 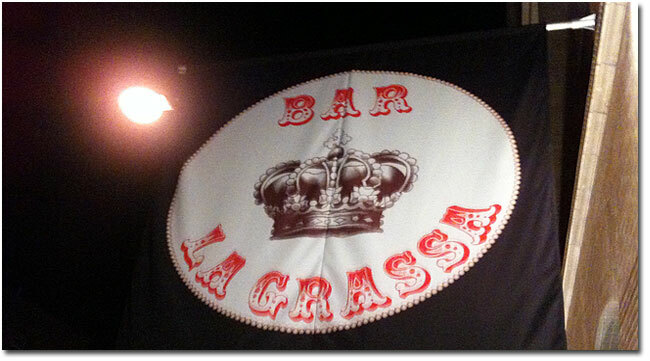 Bar La Grassa is a fun place to people watch, too, with a lot of diversity in the clientele. Day two of my mini ski bum week was spent last Sunday at Welch Village with three of the Miller clan. That was also the day of the big Vikings-Cowboys game, so it wasn’t as crowded as a normal holiday weekend. 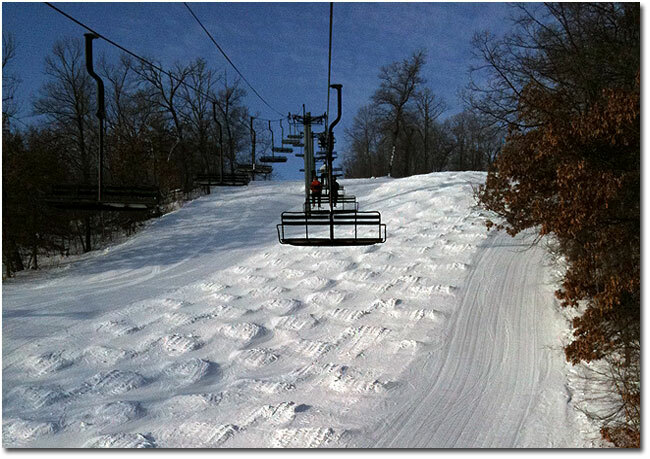 Welch is still one of my local favorites – there are a number of relatively steep, medium-length runs (at least by Midwest standards) that are fun to ski over and over. Chicken, Bakkelyka, Dan’s Dive and Pete’s Pike are now joined by the new back bowl runs Carter’s Cliff, Lauren’s Ledge and several others. That new chair is really nice – too bad all the runs are so short (with a long traverse back). We got in a lot of skiing before lunch, which consisted of the usual fried junk. Kowalski’s is selling advance lift ticket vouchers for $40, which I picked up before I left in the morning. Regular adult tickets are $47, but they can be turned in for a $10 gift card if you ski for less than four hours. Unfortunately, the Kowalski tickets don’t qualify, so I skied until 2:30 before heading home. 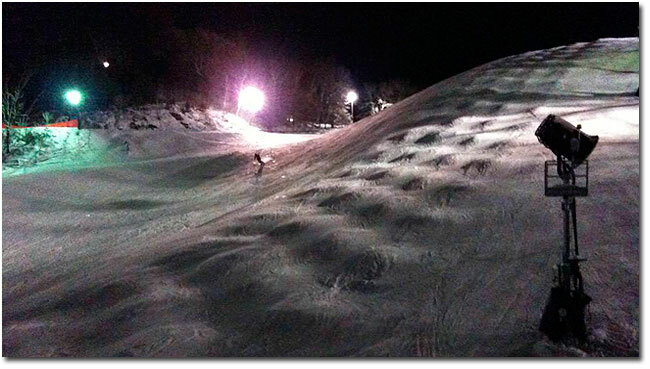 Last night I decided to spy on kid one’s first school ski trip of the year at Afton Alps. The weather has finally been decent and I was really glad to be out again doing something during the winter blahs. The kid wasn’t too excited to see me, so I mainly skied by myself. Her school was based mainly in the Meadows area, so I hit the Highlands (Sally’s Valley and Heather’s Highlands) and the Alps (Barbi’s Challenge and Trudy’s Schuss). Those runs are all nice, but oh so short. I counted turns on one run and struggled to get in 15 before reaching the bottom. Stopped in at all three chalets: looked for the kid in the Meadows chalet, ate a typical ski area dinner in the Alps chalet and sat by the fire with some hot chocolate in the Highlands chalet. Also got to watch part of the crappy Wild game before heading home around 9:15. Night skiing starts at 4:30 and costs $27 for adults. Lifts close at 9:30 (Sunday-Thursday), but some of them shut down before that, so make sure you get where you need to be to avoid lots of skating. Things to Do, #9: Watch the sunrise over Denali.